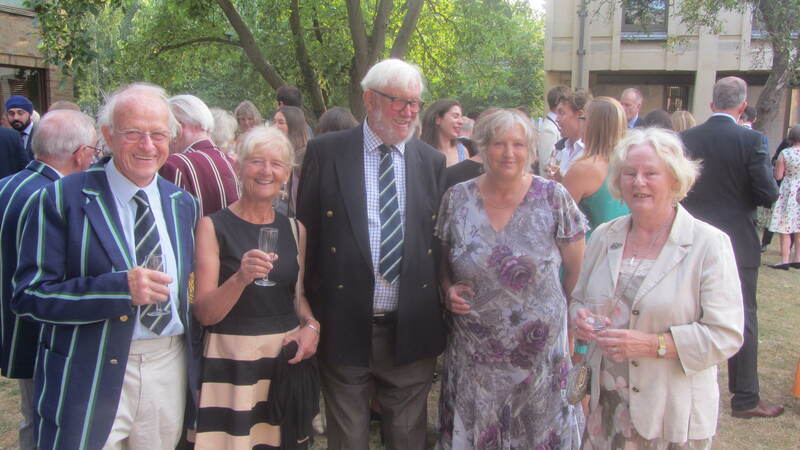 Members of the Cambridgshire Rowing Association decided that this momentous anniversary should be celebrated in the form of a formal dinner and this was held in the wonderful surroundings of Wolfson College. Their were a hundred guests both young and old representing all the local clubs and included many CRA Vice Presidents. Present and past Bump's Secretaries comprising Owen Patman, John Jenner, Stephen Allen and Jess Upton also attended. On a glorious evening the reception, sponsored by Greenwoods GRM was held in the garden before settling down to an excellent dinner in the College Dining Room. After the meal Coner Burgess, member of the Senior Committee of the Cambridge University Combined Boat Clubs gave a speech on behalf of the CUCBC and proposed a toast to the CRA. Bill Key, President of the Cambridgeshire Rowing Association, responded and after an introduction recited his Ode to the Bumps which he had written for the Cambridge Scouts' Boat Club Golden Jubilee in 1973. Presented to Stephen Allen by the President of the Cambridgeshire Rowing Association in recognition of 25 years devoted contribution to the organisation of “The Town Bumps”. Guests mingled in the Dining Hall after the formal dinner before moving to the College Bar where many reminiscences continued to be exchanged until late into the evening. Photographs from the event can be viewed in the photo gallery. For a considerable period since the CRA was formed over 150 years ago local clubs relied heavily on the use of boats owned by the various colleges. Due to these arrangements the majority of the clubs weren't able to start their season until after the University May Races. Many a member of my club, Cambridge Scouts', could be seen lurking in the shadows of the boathouse in June, breathing in the air from the Cam with eager anticipation. In this short season the CRA organised the Time Race, the Town Bumps and Regatta. Although the Time Race has only been held since 1930 the Bumps will be 100 years old next year. The number of crews that rowed in the Town Bumps remained almost constant during the 1960's and 70's. Their were two divisions of 18 crews some of which were from colleges and all were mail participants. The new boathouse in Logan's Way is now completed and boats will be moved in from Saturday 27th May. This storage facility will house 10 x Eights and 10 x Fours. Those using the boathouse are taken from the CRA waiting list and comprise boats belonging to City of Cambridge, Champion of the Thames, Chesterton, Rob Roy and X-Press. Below is a photo showing the new racking system. There are five eights stored either side with a movable middle rack that will take ten fours. Also a photograph of the new building which shows the Camrowers bay on the left and the CRA on the right (downstream). This project was started 5 years ago and is a building of which the local rowing community can be justly proud of.